A monthly Welsh language anti-nonconformist periodical that served the Established Church. 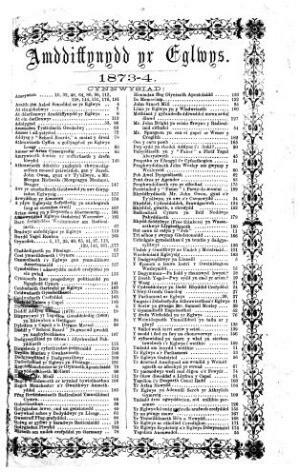 The periodical's main focus was on religious matters alongside articles of a more general subject matter. The periodical was edited by the Reverend Henry Thomas Edwards (1837-1884), the Reverend David Walter Thomas (Gwallter Geraint o Geredigion, 1829-1905) and Canon Daniel Evans (1832-1888). Associated titles: Y Llan (1882).